The Burlington Board of School Commissioners seeks to focus the District on significant improvement in student achievement outcomes and closure of achievement gaps, while creating strong connections between the Board and the Burlington community. To do this, the Board adopted a way of working, the policy governance model, on March 16, 2017. This model is being used in a growing number of school districts, cities, and non-profit organizations in Vermont and the nation. The Board’s work essentially becomes that of continuously evaluating the work of the superintendent in relation to the broad outcomes it has specified, and continuously engaging the community. With the transition to policy governance, the Board established several kinds of policies which have been amended over time, including substantial changes in 2018 and 2019. Both current and former policies can be found below. What is the work of the Board? Its responsibilities are specified by Vermont state statute and generally involve engaging the community and establishing a vision for the district; creating policies; hiring and evaluating the Superintendent; developing a budget for community approval and ensuring financial stability; monitoring the district’s evolving work towards the vision; and ensuring ethical work. The Board’s governance style, or way of working, guides its approach to the meetings and processes which carry out Board responsibilities. Ends policies: articulating a vision. The Board governs by focusing on what should be the results, or ends, of the district’s work (e.g., what students should know, understand, and be able to do by the time they graduate). The ends statement is both a commitment to the community about the goals for the district, as well as a direction to the superintendent about what results the Board expects to see. The particular methods for accomplishing those ends are left to the education professionals in the district. Governance Process policies: establishing Board process. The Board works intentionally, creating policies that describe how it operates, including a commitment to monitor its own performance of its duties. Governance process policies create clarity about the Board’s role in the district. Executive limitations: setting limits on the superintendent. The Board establishes policies which limit what the superintendent cannot do in order to achieve the district’s expected results (the ends determined by the Board). Within this framework, the superintendent has power to choose any reasonable method to meet the desired ends. Policies required by the state or federal government: Both state and federal law mandate policies that address particular issues. The district complies with all pertinent state and federal laws and maintains all required policies. The number of Board committees is sharply reduced, because the whole Board takes responsibility for monitoring the district’s work towards the specified ends. The number of community forums will increase, as the Board seeks to engage the community on topics that are pertinent in strategic planning and development. The community plays an important role in advising the board about its values and expectations. Board meetings will shift to focus on reviewing more detailed monitoring reports, revealing how the district is working toward ends. In addition, some of the monitoring reports will address how the Board itself evaluates its own work. Monitoring reports provide the board with data; the board then decides whether the district’s actions are in compliance with a reasonable interpretation of the policy. Evaluating monitoring reports keeps the Board’s focus on whether the district is achieving the specified ends. If a monitoring report does not convince the Board that the district is in compliance with a given policy then the board will direct the superintendent to revise and resubmit the report. Regular monitoring allows the Board to decide whether policies need revision and whether the general trends in the district are moving towards the ends. The Burlington School District exists so that every student will graduate having achieved their highest academic, intellectual, and personal potential, and be prepared to thrive in a global community. In achieving this goal, the district will act inclusively and equitably, recognizing the diversity of our student body. Reducing Disparities. The difference in academic achievement between the highest achieving and lowest-achieving student groups will decrease. The Superintendent of the Burlington School District shall not cause or allow any practice, activity, decision, or organizational circumstance that is unlawful, unsafe, imprudent, or in violation of commonly accepted educational and professional ethics and practices. With respect to interactions with students and parents/guardians of the Burlington School District or those applying to be students or parents/guardians, the Superintendent shall not cause or allow conditions, procedures, or decisions that are untimely, unclear, or unnecessarily intrusive. Elicit information for which there is no clear necessity. Use methods of collecting, reviewing, transmitting, or storing student/family information that fail to protect against improper access to the material elicited. Fail to operate facilities with appropriate accessibility and privacy. Fail to establish with students and parents/guardians a clear understanding of what may be expected and what may not be expected from the services offered. Fail to inform students and parents/guardians of this policy or to provide a way to be heard for persons who believe they have not been accorded a reasonable interpretation of their protections under this policy. Fail to implement restorative practices for addressing social/behavioral issues. The Superintendent shall not cause or allow disparities in suspension rates between different groups. Operate without written personnel rules that (a) clarify rules for staff, (b) provide for effective handling of grievances, and (c) protect against wrongful conditions. Discriminate against any staff member for non-disruptive expression of dissent. Fail to acquaint staff with the Superintendent’s interpretation of their protections under this policy. Cause or allow the recruitment or hiring of administrators, faculty or staff outside of the district’s inclusive recruitment and hiring processes designed specifically to increase and ensure a culturally proficient and diverse workforce in the District. a. The posted job description/specification. b. Resume or CV of the recommended hire. c. Summary of the candidate pool. d. Listing of the candidates who made the final round of consideration and a summary of each candidate. e. Listing of who interviewed the candidates. f. Rational for the selection of the recommended hire. g. Any other information that is pertinent to the Board’s deliberation or decision to approve the hire. h. The communication plan for after the hiring is finalized. a. Hire a permanent or interim building leader or assistant building leader without involving staff from the building or program and parents/guardians of students currently in the school/program in the vetting and interviewing process. b. Fail to gain the best candidates due to lack of timely internal and external publication and posting of open positions. c. Fail to appropriately communicate to staff, students, and families on hiring of building leaders and assistant building leaders, both interim and permanent. Expend more funds than have been budgeted. Incur debt in an amount greater than can be repaid by certain otherwise unencumbered revenues within sixty days. Conduct interfund shifting in amounts greater than can be restored to a condition of discrete fund balances by certain otherwise unencumbered revenues within thirty days. Allow payroll and debts to be settled in an untimely manner. Make a single unbudgeted purchase or commitment of greater than $25,000. Splitting orders to avoid this limit is not acceptable. Allow receivables to be unpursued after a reasonable grace period. a. The Superintendent must not operate without multi-year strategic plans and annual budgets that address intentional and improved Ends accomplishment along with avoidance of fiscal jeopardy. Omit credible projection of revenues and expenses, separation of capital and operational items, cash flow, and disclosure of planning assumptions. Provide less for board prerogatives during the year than is set forth in the Governance Investment Policy. The Superintendent shall not cause or allow district assets to be unprotected, inadequately maintained, or unnecessarily risked. Allow board members, staff and the District itself to be inadequately insured against theft and casualty losses and liability. Allow un-bonded personnel access to material amounts of funds. Unnecessarily expose the District, its board, or its staff to claims of liability. Allow information and files to be exposed to loss or significant damage. Allow for practices that do not comply with Generally Accepted Accounting Principles. Compromise the independence of the board’s audit or other external monitoring or advice. Endanger the District’s public image, its credibility, or its ability to accomplish Ends. Close any buildings as public schools. Deviate from Burlington Investment Procedures or expose any Burlington School District endowments to unnecessary financial risk. To protect the Burlington School District from loss of Superintendent services, the Superintendent shall not permit there to be fewer than two other executives sufficiently familiar with the Burlington School Board and Superintendent issues and processes to enable either or both in combination to take over with reasonable proficiency as an interim successor. With respect to employment, compensation, and benefits to non-unionized employees, consultants, contract workers, the Superintendent shall not cause or allow jeopardy to financial integrity or to public image. Change the Superintendent’s own compensation and benefits. Promise or imply permanent or guaranteed employment. Establish or change compensation and benefits that deviate materially from the geographical or professional market for the skills employed. Create greater obligations over a longer term than revenues can be safely projected, and in all events subject to losses in revenue. The Superintendent shall not cause or allow the Board to be uninformed or unsupported in its work. Neglect to submit monitoring data required by the board (see policy 3.4 on monitoring Superintendent performance) in a timely, accurate, and understandable fashion, directly addressing the provisions of Board policies being monitored. Allow the board to be unaware of any actual or anticipated noncompliance with any Ends or Executive limitations policy, regardless of the Board’s monitoring schedule. Neglect to submit unbiased decision information required periodically by the Board or let the Board be unaware of relevant trends. Allow the Board be unaware of any significant incidental information it requires, including anticipated media coverage, threatened or pending lawsuits, and material internal and external changes. Allow the board be unaware if, in the Superintendent’s opinion, the Board is not in compliance with its own policies on Governance Process and Board-Management Delegation, particularly in the case of Board behavior that is detrimental to the work relationship between the Board and the Superintendent. Present information in unnecessarily complex or lengthy form or in a form that fails to differentiate among information of three types: monitoring, decision preparation, and incidental. Allow the board to be deprived of a workable mechanism for official board, officer, or committee communications. Deal with the board in a way that favors or privileges certain board members over others except when responding to officers or committees duly charged by the Board. Allow the board to do its work without the necessary items on its consent agenda. Necessary items are those decisions delegated to the Superintendent yet required by law, regulation or contract to be board-approved, along with applicable monitoring information. Decisions or instructions of individual Board members, officers, or committees are not binding on the Superintendent except in rare instances when the Board has specifically authorized such exercise of authority. In the case of Board members or committees requesting information or assistance without Board authorization, the Superintendent can refuse such requests that require, in the Superintendent’s opinion, a material amount of staff time or funds or is disruptive. The Board will never give instructions to persons who report directly or indirectly to the Superintendent. The Board will view successful Superintendent performance as demonstrated by accomplishment of Board-stated Ends and avoidance of Board-proscribed means. The Board will develop policies instructing the Superintendent to achieve specified results for specified recipients at a specified cost. These policies will be developed systematically from the broadest, most general level to more defined levels and will be called Ends policies. All issues that are not Ends issues as defined here are means issues. The Board will develop policies that limit the latitude the Superintendent may exercise in choosing the organizational means. These policies will be developed systematically from the broadest, most general level to more defined levels, and they will be called Executive Limitations policies. The Board will never prescribe organizational means delegated to the Superintendent. As long as the Superintendent uses any reasonable interpretation of the Board’s Ends and Executive Limitations policies, the Superintendent is authorized to establish all further procedures, make all decisions, take all actions, establish all practices, and pursue all activities. Such decisions of the Superintendent shall have full force and authority as if decided by the Board. The Board may change its Ends and Executive Limitations policies, thereby shifting the boundary between Board and Superintendent domains. By doing so, the Board changes the latitude of choice given to the Superintendent. But as long as any particular delegation is in place, the Board will respect and support the Superintendent’s choices. Monitoring allows the board to determine the degree to which board policies are being met. Information that does not do this will not be considered to be monitoring information. (c) by direct Board inspection, in which a designated member or members of the Board assess compliance with the appropriate policy criteria. In every case, the Board will judge: (a) the reasonableness of the Superintendent’s interpretation and (b) whether data demonstrate accomplishment of the interpretation. In every case, the standard for compliance shall be any reasonable Superintendent interpretation of the Board policy being monitored. The Board is the final arbiter of reasonableness but will always judge with a “reasonable person” test rather than with interpretations favored by Board members or by the Board as a whole. All policies that instruct the Superintendent will be monitored at a frequency and by a method chosen by the Board. The Board can monitor any policy at any time by any method but will ordinarily depend on a routine annual schedule. 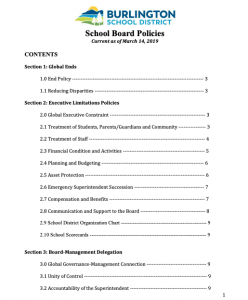 The purpose of the Board, on behalf of Burlington, is to see to it the Burlington School District (a) achieves appropriate results for students at an appropriate cost (as specified in Board Ends policies) and (b) avoids unacceptable actions and situations (as prohibited in Board Executive Limitations policies). The Board will cultivate a sense of group responsibility. The Board, not the staff, will be responsible for excellence in governing. The Board will be the initiator of policy, not merely a reactor to staff initiatives. The Board will not use the expertise of individual members to substitute for the judgment of the Board, although the expertise of individual members may be used to enhance the understanding of the Board as a body. The Board will direct, control, and inspire the District through the careful establishment of broad written policies reflecting the Board’s values and perspectives. 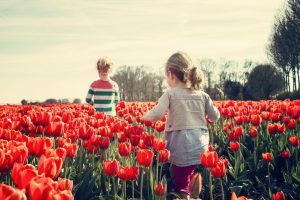 The Board’s major policy focus will be on the intended long-term Ends, not on the administrative or programmatic means of attaining those Ends. Board values will be drawn from the diverse values of the community informed by sources both internal and external to the District. The Board will enforce upon itself whatever discipline is needed to govern with excellence. Discipline will apply to matters such as attendance, preparation for meetings, policymaking principles, respect for the distinction between its role and that of the Superintendent, and ongoing improvement of board governance processes. Although the Board can change its Governance Process policies at any time, it will scrupulously observe those currently in force. The Board will monitor and discuss the board’s process and performance on a regular basis, but not less than quarterly. Self-monitoring will include comparison of Board activity and discipline to policies in the Governance Process and Board-Management Delegation categories. Hire, negotiate a contract with, set compensation for, and evaluate the Superintendent. (a) Seeking input regarding community values on issues of Ends and ethics. (b) Educating the community on issues impacting the district. (c) Reporting to the community on district performance. (d) Ensuring the community and other stakeholders who bring non-Board issues to the Board are courteously and respectfully referred to the appropriate process for getting their issue addressed by the District. Create and maintain written governing policies that realistically address the broadest levels of all Board and District decisions and situations. (a) Ends: District outcomes, impacts, benefits, recipients, and their relative worth (what good for which recipients at what cost). (b) Executive limitations: constraints on executive authority that establish the boundaries within which all executive activity and decisions must take place. (c) Governance process: specification of how the Board conceives, carries out, and monitors its own task. (d) Board-management delegation: how power is delegated and its proper use; the Superintendent’s role, authority, and accountability. Be familiar with all required policies in effect. The Board will follow a strategic work plan and annual agenda that focuses our attention upward and outward. (d) the Superintendent evaluation and compensation decisions as outlined in our Board-Management Delegation policies. Board meeting agendas will be determined by the Board Chair, and may be modified at the meeting by a majority vote of the Board. (a) A Board member may recommend or request an item for Board discussion by submitting the item to the Chair no later than five days before the agenda is to be warned. (b) Only the majority of the Board can remove an item from the consent agenda for discussion. To promote efficient and consistent work by the Board, the Board selects three officers: Chair, Vice-Chair and Clerk. The Chair and Vice-Chair must be members of the Board and shall be elected. The Clerk shall be elected by the Board. (a) These officers are selected annually during a public meeting (called the “Organizational Meeting”) in the first week of April. A Commissioner who is senior in length of continuous service and does not intend to submit their name to be considered for an office is responsible for scheduling the meeting, setting the agenda, calling the meeting to order, and facilitating the election of Chairperson. (b) Nominations will be made from the floor and seconded. (c) Elections are by roll call. A nominee must receive a majority vote of the members present (and not abstaining) for election to office. If no nominee receives a majority vote, another round of voting is required until a majority is achieved. (d) The first order of business will be the election of the Chairperson. (f) The second order of business will be the election of the Vice Chair. (g) The third order of business will be the election of the Clerk. (j) The Board may remove an officer from office by roll call vote only when not fewer than three-quarters of all sitting commissioners vote in favor of removal. If an officer is removed from office, an election will be held immediately as set forth above to fill such office. (a) The assigned result of the Chair’s job is that the Board behaves consistently with its own rules and those legitimately imposed on it from outside the District by charter, statute or regulation. Ii) The Chair will ensure that the Board fulfills its obligations and work to improve the Board’s performance. (b) The Chair may represent the Board to outside parties in announcing Board-stated positions and in stating chair decisions and interpretations within the area delegated to her or him and report such activity at the next meeting of the Board. (c) The Chair may delegate this their authority but remains accountable for its use. (d) The Chair has no authority to make decisions about policies created by the Board within Ends and Executive Limitations policy areas. Therefore, the Chair has no authority to supervise or direct the Superintendent. (e) The Chair is empowered to chair Board meetings with all the commonly accepted powers of that position, such as ruling and recognizing. i. Meeting discussion content will consist solely of issues that clearly belong to the Board to decide or to monitor according to Board policy. ii. Information that is neither for monitoring performance nor Board decisions will be avoided or minimized and always noted as such. iii. Deliberation will be fair, open, and thorough but also timely, orderly, and kept to the point. Vice Chair: The Vice Chair shall perform the duties of the Chairperson should the Chair be unavailable, or as otherwise delegated by the Chairperson. Clerk: The Clerk shall keep a written record of the proceedings of the Board and publish them according to statute. The Clerk may delegate some or all of their delegable responsibilities to staff who are not Board members, but the Clerk remains accountable for the records to be kept and published appropriately. The Board commits itself and its members to ethical and lawful conduct, including proper use of authority and appropriate decorum when acting as Board members. Members must demonstrate loyalty to the District, unconflicted by loyalties to staff, outside organizations, or any personal interests as Parents or Guardians. (a) Board members will be familiar with, and adhere to, those provisions of Vermont education law which define School Board powers and govern Board member compensation and public bidding processes. (b) A Board member will do nothing intended to leave the impression that his or her position on any issue can be influenced by anything other than a fair presentation of all sides of the question. Members will be properly prepared for, attend, and participate fully in all Board meetings and trainings. Members will support the legitimacy and authority of the final determination of the board on any matter, irrespective of the member’s personal position on the issue. Board committees, when used, will be used to help the Board accomplish its work. 3. The committee will not have the power to act for the Board but will make recommendations to the Board. Committee recommendations and reports will become an official part of Board minutes. Because good governance is essential to the successful achievement of the District’s Ends, the board will invest in its governance abilities. Appropriate funds shall be allocated each year to ensure that at minimum, Board skills, methods, and supports will be sufficient to ensure governing with excellence. (a) Training will be used to orient new members, as well as to maintain and increase existing member skills and understandings. (b) Outside monitoring assistance will be arranged so that the Board can exercise confidence in its control over District performance. This includes, but is not limited to, financial audits. (c) Outreach mechanisms will be used as needed to ensure the board’s ability to listen to the community’s viewpoints and values. The board will establish its Board budget for the next fiscal year when budget parameters are established. Nothing in these policies shall limit or prohibit the Board from exercising the Board’s authorities, rights and duties under applicable law, including without limitation the Board’s right to take direct action by resolution consistent with Robert’s Rules of Order and the Board’s enabling legislation, found in Articles 57 through 60, inclusive, of the City of Burlington municipal code. Any policy that attempts to limit or prohibit the board from exercising its statutory authority, rights or dutiesis invalid and unenforceable. Notwithstanding anything to the contrary in these policies, Board members may make requests for information or documents from the Superintendent (and committee chairs may make such requests directly to that committee’s assigned staff member). The Superintendent shall reasonably and timely comply with suchrequests, unless the Superintendent reasonably believes the request to be unduly burdensome, unreasonable or inappropriate, in which case, the Superintendent shall refer such request to the Board Chair, who shall determine whether such request is unduly burdensome, unreasonable or inappropriate. In the event the Board Chair determines such information request to be unduly burdensome, unreasonable or inappropriate, nothing shall preclude the requesting Board member from making a public records request under applicable law as if such Board member were a member of the general public. Notwithstanding anything to the contrary in these policies, Board members may communicate directly with school district employees.